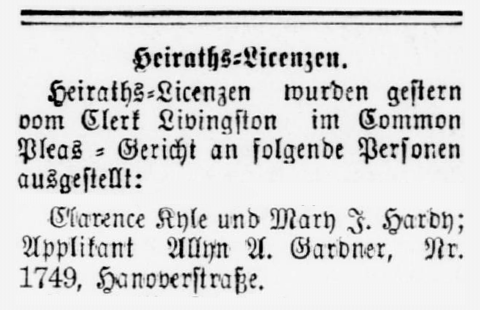 I found something interesting yesterday, a reference to my great-grandfather in one of Baltimore’s German language newspapers, Der Deutsche Correspondent, on December 1, 1899. Der Deutsche Correspondent was Baltimore’s daily German newspaper, and it was published for nearly eighty years, from the early 1840s to 1918. Clarence Kyle and Mary I. Hardy; Applicant Allyn A. Gardner, No. 1749, Hanover Street. I wonder if the address listed isn’t meant to be the address of the witness but rather the address of the wedding’s location. 1749 Hanover Street was where my great-grandfather lived with his sister Isabelle, her family (second husband, children, and step-children), and his mother Susan before his marriage in 1900. One of his brothers lived next door, the other lived across the street. After 1900, the Gardner clan began to scatter throughout Baltimore, one to Clarkson Street, one to Charles Street. Allyn himself moved several blocks north to near his wife’s family. Toward the end of the decade, another sister from Washington moved to the neighborhood, initially living near Allyn’s sister Isabelle and eventually moving to a block from Allyn by the end of the decade. Who are Clarence Kyle and Mary Hardy? I have no idea. According to the 1904 City Directory, Clarence was a fireman. At the time of the marriage, Mary was sixteen. Mary could have been a “sort of” cousin; Allyn’s mother’s first husband was a Hardy, and Allyn had two Hardy half-brothers, so it’s not inconceivable that Susan could have been Mary’s aunt. Clarence and Mary are buried in Baltimore’s Loudon Park Cemetery, one section over from Allyn’s mother, and I’ve probably walked past them a half dozen times. My great-grandfather Allyn would have just turned twenty. I’m assuming he was the witness, which means that, whoever Clarence and Mary Kyle were, they weren’t unknown to him. There is another possibility that occurred to me. If Mary Hardy is connected familially with Allyn Gardner in some way, it is possible that she’s his niece. As mentioned, Allyn had two half-brothers through his mother, Thomas Hardy (born 1861) and Henry Hardy (born 1865). Henry I know very little about, except that he was his mother’s favorite child and had probably died by 1902; the commonness of the name makes him difficult to trace. Thomas, on the other hand, I know a little bit more. He, his wife, three of his children, and large parts of his wife’s family are buried in Washington’s Congressional Cemetery. (In one of life’s strange coincidences, in the 20th-century Thomas and his family lived across the street from the house where my great-grandfather had been born and his mother had lived in Washington in the 19th.) Thomas’s daughter Katie was born in 1884. I don’t know enough yet, and this is purely speculative, but perhaps Mary Hardy was also Thomas’s daughter, which would make my great-grandfather’s relationship to the bride not “sort of cousins” but uncle and niece. This discovery isn’t significant, but it’s interesting.